Elemental Mage card dishes out the pain next month. Metabomb is excited to reveal a new card from Hearthstone's upcoming expansion, Rastakhan's Rumble. 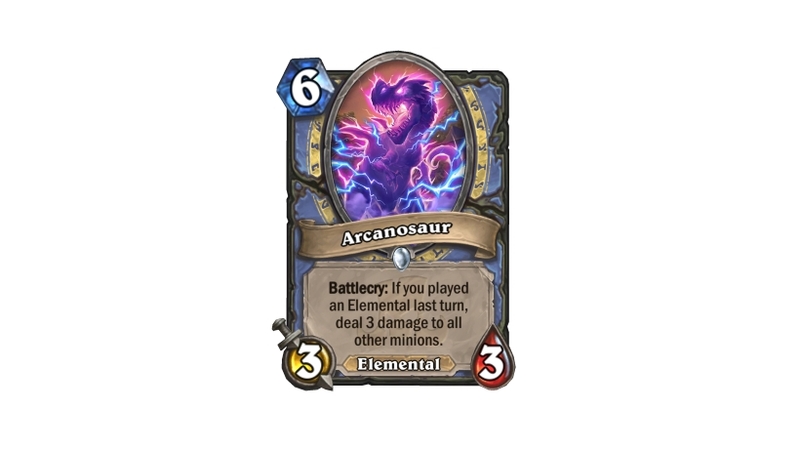 Named Arcanosaur, it's a six Mana 3 / 3 Elemental minion with a Battlecry that inflicts three points of damage against all other minions (including your own) if you played another Elemental on the previous turn. With a six Mana cost there's sadly no room for the Arcanosaur to take its place in the increasingly promising Elemental Odd Mage deck that's taking shape ahead of release. As noted by Blizzard, however, there is a lot of potential to play this card post-Frost Lich Jaina, and clean up with a serious chunk of healing thanks to Jaina's always-welcome Elemental Lifesteal effect. In that sense it's more likely we'll see this one being played in a Control Mage deck list. We'll have to see how the new meta shakes out over time, and whether Arcanosaur makes the cut in the long run. Rastakhan's Rumble is due for release on Tuesday 4th December 2018. There'll be the usual 130+ cards to add to your collection, a new Overkill keyword, and a single player mode called Rumble Run - that'll launch the following Thursday.